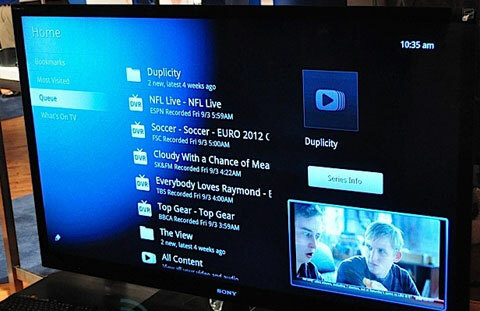 Sony unexpectedly unveiled their first model of Google TV at retailer Best Buy’s press event in New York today. The set is 46-inches with a flashy LCD screen and its model number is NSX-46GT1. Sony is also offering its own chrome lipped stand to buyers when it starts shipping. Not much was revealed in terms of the device’s software but it did show a rear USB-mounted WiFi dongle used for the internet features to go along with the Dish network receiver below. It is expected to bring integrated search across internet and TV listings, web browsing and much more from Google’s platform in order to make it the next big thing in the TV market. The first Google based HD TV is expected to start shipping in the holiday season at Best Buy but no prices have been revealed. Sony is also rumoured to be holding a special event on 12th October to show off the TV’s offerings in detail. With Apple TV already shipping, Google and Sony will obviously want to launch their new product as soon as possible and also bring something that their rivals do not, to lure users. TVs with integrated internet facilities is definitely the next big thing as figures showing users going online to view their entertainment content continue to break records. Would you buy a Google TV from Sony?